A couple of evenings ago I went to the Toowong Cemetery, the largest burial grounds here in this fine city of Brisbane, with the intention of taking a few photos and admiring the sunset from a unique location. 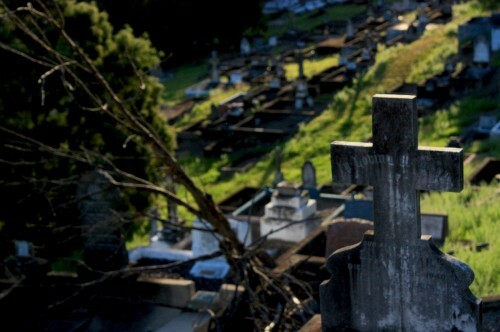 Rumoured to be haunted, the cemetery is situated on 200 acres by the side of Mt Coot-tha, and much it is positioned on a slant overlooking the city skyline. I have wanted to take evening photos here ever since I first set foot in Brisbane in 2005, and it's taken me five years to return and fulfil the dream.